Murchison Falls National Park is a national park in Uganda and managed by the Ugandan Wildlife Authority. It is in north-western Uganda, spreading inland from the shores of Lake Albert, around the Victoria Nile, up to the Karuma Falls. Together with the adjacent 748 square kilometers (289 sq mi) Bugungu Wildlife Reserve and the 720 square kilometers (280 sq mi) Karuma Wildlife Reserve, the park forms the Murchison Falls Conservation Area (MFCA). The park straddles the Ugandan districts of Buliisa, Nwoya, Kiryandongo, and Masindi. The driving distance from Masindi, the nearest large town, to the Kibanda area of the national park is about 72 kilometers (45 mi). This area is about 283 kilometers (176 mi), by road, north-west of Kampala, the capital and largest city of Uganda. The coordinates of the park near the Kibanda area are 02°11’15.0″N, 31°46’53.0″E (Latitude: 2.187499; Longitude: 31.781400). The explorers John Speke and James Grant were the first Europeans to visit the present day MFCA in 1862. It was more thoroughly explored by Samuel and Florence Baker in 1863-4. Baker named the falls Murchison Falls after the geologist Roderick Murchison, then the president of the Royal Geographical Society. Between 1907 and 1912, the inhabitants of an area of about 13,000 square kilometers (5,000 sq mi) were evacuated due to sleeping sickness spread by tse-tse flies. In 1910, the Bunyoro Game Reserve was created south of the River Nile. That area roughly corresponds to the part of the MFNP that is in the districts of Buliisa, Masindi, and Kiryandongo. In 1928, the boundaries were extended north of the river into the modern-day Nwoya District. In 1952, the British administration established the National Parks Act of Uganda. The area described above became Murchison Falls National Park. 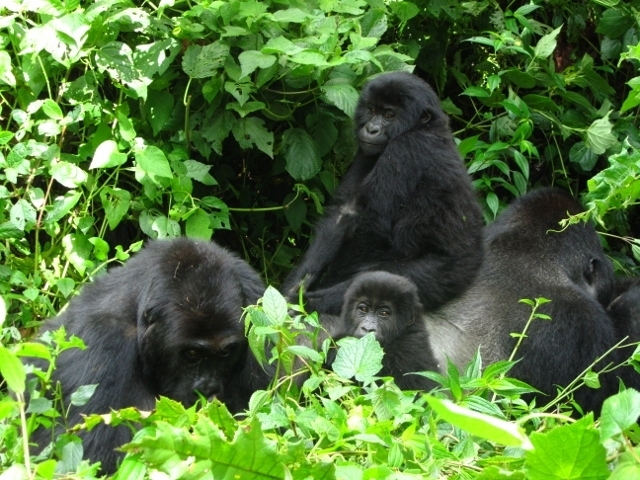 MFNP is Uganda’s largest national park. It measures approximately 3,893 square kilometers (1,503 sq mi). The park is bisected by the Victoria Nile from east to west for a distance of about 115 kilometers (71 mi). The park is the location of the Murchison Falls, where the waters of the Nile flow through a narrow gorge only 7 meters (23 ft) wide before plunging 43 meters (141 ft). Also in the park, adjacent to the Masindi-Gulu Highway, are the Karuma Falls, the location of the 600 megawatt Karuma Power Station, which will be Uganda’s largest power station when it comes online circa 2018. MFCA and the adjacent Bugondo Forest Reserve have 76 species of mammals as well as Uganda’s largest population of crocodiles. 450 bird species are present ranging from easy variety of waterbirds including the rare shoe-billed stork, Bugondo’s 59 “restricted range” species, dwarf kingfisher, Goliath heron, white-thighed hornbill and great blue turaco.